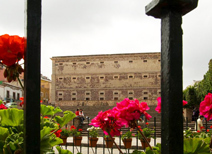 Having served as a grain warehouse during the colonial era and known for being the location of the first defeat suffered by the Spaniards during the insurgency, the Alhondiga de Granaditas is an irreplaceable historic site. 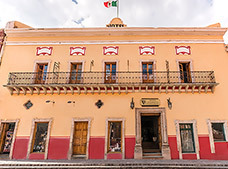 Today it is home to the Regional Museum of Guanajuato, where you’ll find archeological artifacts, areas devoted to local arts and customs and an exhibition that chronicles the events that took place during the struggle for independence. 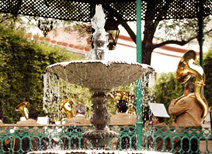 Considered the most important cultural event in Latin America, the Festival International Cervantino takes place each year in October. Throughout the festival, audience members revel in theater and dance performances as well as visual arts and other creative expressions from around the world. 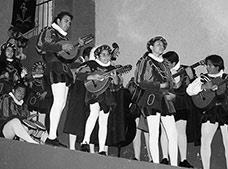 Its name comes from the shows performed by university students during the annual “Entremeses de Miguel de Cervantes Saaevedra”, which was gradually added to until it became the cultural event that it is today. 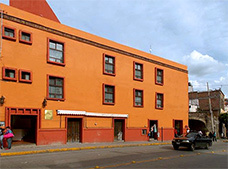 Located next to Union Garden, the Juarez Theater is the starting point of the Callejoneadas and the headquarters of the Cervantino as well as many other cultural events throughout the year. 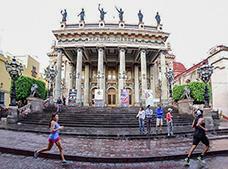 Known for its fine architecture, the building features the muses of the Fine Arts at the top, bronze lions on the steps and columns designed in an ancient Greek style. 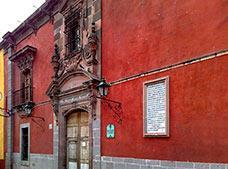 For many years this was a temple and the main cemetery of Guanajuato. 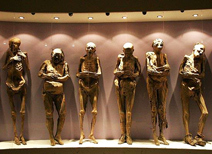 The ancient mummies were discovered in 1865 and there are many theories to explain this mystery, as Guanajuato is the only place where this occurs naturally. Currently there are over 100 mummies of men, women and children distributed throughout the museum. This beautiful monument was erected by Catholics during the Cristero War to protest against the foreign policy that the Mexican government wished to impose. 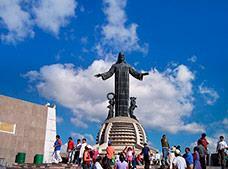 It is located at the top of Mount Cubilete in Silao, just 15 minutes away from Guanajuato. 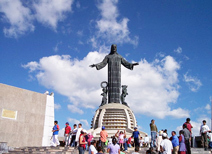 The sanctuary can be reached by climbing nine miles from the foot to the top of the hill, where you’ll find a modern basilica shaped like a globe situated beneath a majestic 65 foot high statue of Christ. 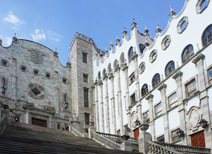 This imposing seventeenth century basilica features an ornate facade and richly ornamented towers and steeples that showcase the famous baroque beauty of the temple. 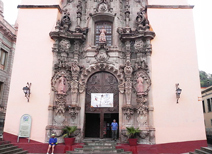 Within the interior are arches decorated with rosettes and the neoclassical main altar that displays an image of Our Lady of Guanajuato. 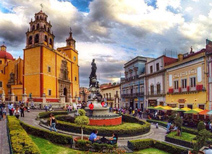 Considered one of the most significant plazas in the city, this semi-triangular shaped square features a beautiful, centrally located sculpture that was inaugurated by President Porfirio Diaz in 1903. 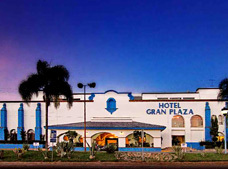 The plaza has been the site of major historical events, including Benito Juarez’ proclamation of Guanajuato as the capital of Mexico and the mining riots against the injustices of the colonial government. This beautiful Guanajuato garden dates back to the colonial era, when it was home to a flea market and often used for traditional festivals. 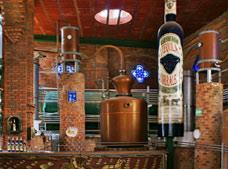 Today, it is a meeting place for locals heading out to the city’s restaurants and bars. Each year on Good Friday, the Day of the Flowers is celebrated at the garden, where you’ll see altars dedicated to the Virgin of Sorrows, street vendors, and men giving away flowers to women they find attractive. 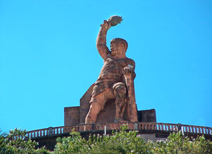 One of the best panoramic views of Guanajuato is offered from the Pipila Monument, erected to honor the outstanding hero who participated in the assault on Alhondiga de Granaditas. 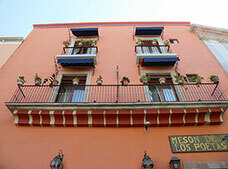 The site can be reached by the funicular railway located next to the Juarez Theater or via Callejon del Calvario (Calvary Alley) if you wish to make the journey on foot. Using small figurines, audiovisual effects and creative recreations of historic events, this museum showcases some of the most famous local legends. 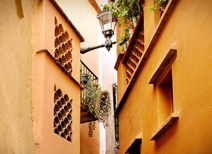 During your visit you’ll hear about stories like the Callejon del Beso (Alley of the Kiss), La Bufa, the Baratillo and the Pipila, along with other fascinating stories that have been passed down through the years. 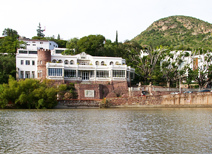 The city of Guanajuato proudly exhibits this beautiful eighteenth century house, where one of the most internationally recognized Mexican artists was born, the master Diego Rivera. The museum houses perfectly preserved furniture once used by the Rivera family as well as 100 pieces of his original artwork. One of the largest collections of paintings in the country, the exhibit showcases the various trends and styles that made him so famous. 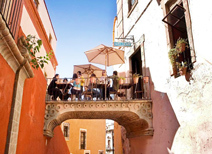 The “Alley of the Kiss” is one of the most popular tourist attractions in Guanajuato. 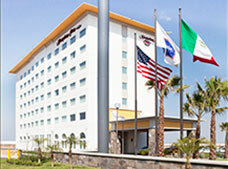 Located near Plazuela de los Angeles, this was the site of a tragic love story between an upper class woman named Ana and a poor miner named Carlos. 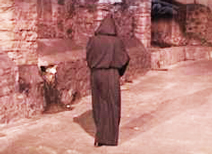 It is said that the two fell in love against her father’s wishes. 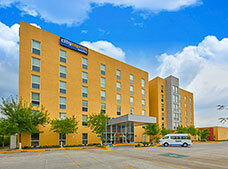 So that they could enjoy their romance in secret, Carlos rented the room that was across from his beloved. When the father discovered their secret meetings, he murdered Ana in a blind rage and Carlos’ pain was so great that he ended his own life by jumping into a mine. 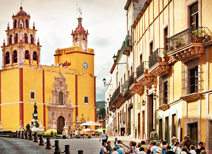 Inaugurated in 1987, in the presence of the Mexican and Spanish presidents, as well as the state governor, this tribute to the city of Guanajuato celebrates the iconic author during the Festival Internacional Cervantino. It features an iconographic collection of works donated by Don Eulalio Ferrer of Spain, who amassed an assortment of compositions from around the world that allude to his favorite character. 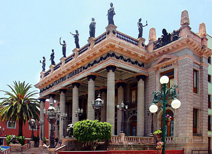 The highest seat of learning in the state, the University of Guanajuato is one of the most beautiful buildings in the historic center and has been immortalized on the 1,000 peso banknote. 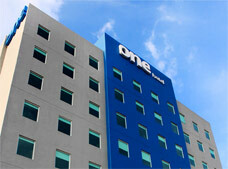 The building is known for its steps and the incredible view of Pipila that can be seen from its highest point. 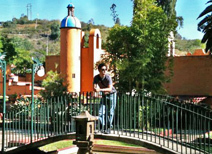 Located by the Cuesta del Tecolote, this bridge was the entry point for Miguel Hidalgo and the insurgents from the city of Dolores. 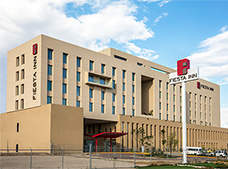 Just a few yards away from the Cervantes Theater and Embajadoras Park, it currently has several hotels and is one of the most emblematic bridges in the city. 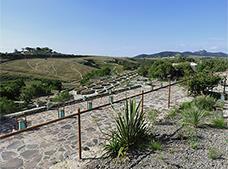 Completed in 1749, the Olla Dam supplied water to the city and created an incredible panorama. 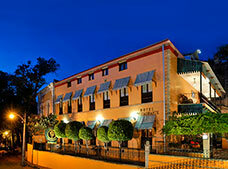 During the Porfiriato, an avenue with French style buildings was constructed, resulting in what is known as the Paseo de La Presa. 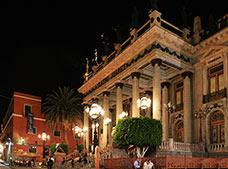 Today this area is home to the Escuela Normal Superior and other beautiful structures. 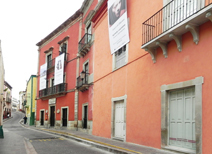 Símbolo del esplendor de la ciudad durante la época colonial, la Mina La Valenciana forma parte de la lista de construcciones que le valieron a Guanajuato el título de Patrimonio Cultural de la Humanidad. De ella se extraían las dos terceras partes del total de la producción de plata en la Nueva España. 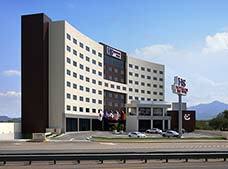 Como homenaje a su riqueza fue construido el Templo de San Cayetano, donde destaca el uso de cantera rosa y su fachada tallada en estilo barroco. Aunque sigue operando como mina, su principal función es ofrecer recorridos guiados para que los turistas aprendan cómo trabajaban los obreros y aprecien la maquinaria utilizada en su labor. 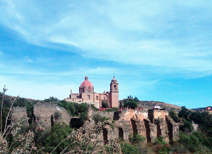 A symbol of the city’s colonial splendor, La Valenciana Mine is one of the places that has earned the distinction of being named a Guanajuato Cultural Heritage site. 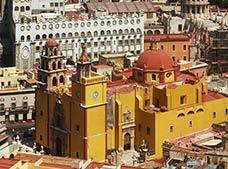 Two-thirds of all of the silver produced in New Spain were extracted from the mine and the Temple of San Cayetano, with its pink stone and baroque facade, was constructed as a tribute to its wealth. While the mine is still operational, the site is now used to educate tourists on how it worked and what equipment was used. 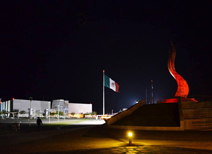 To strengthen the sense of national identity and celebrate the 200th anniversary of Mexico’s Independence, the state government opened Guanajuato Bicentennial Park in 2010. 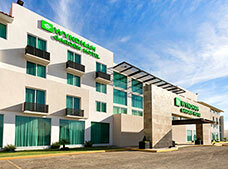 Located on the road to Silao, this building houses both permanent and temporary exhibits inspired by various themes. 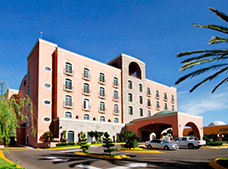 This is also a popular venue for special events like the visit of Pope Benedict XVI and the “Guanajuato Si Sabe” food festival. Located near Union Garden, this majestic seventeenth century temple has a pink stone facade that is a classic example of the Mexican Churrigueresque style. 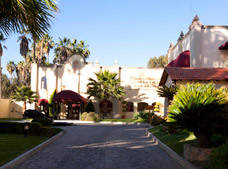 Inside is a venerated image of Cristo de Burgos along with an impressive collection of eighteenth century Mexican artwork that is worthy of any European museum e for special events like the visit of Pope Benedict XVI and the “Guanajuato Si Sabe” food festival.